According to TMT Finance’s analysis, over US$50bn of TMT related financing deals were announced in Asia in 2017. Larger deals included: the financing packages for a Bain Capital-led consortium’s leveraged buyout of Toshiba’s silicon chip unit for US$18bn; SoftBank’s US$24bn refinancing for its acquisitions of US mobile carrier Sprint and UK chipmaker ARM Holdings. Elsewhere, I Squared Capital bought Hutchison Global Communications Investment Holding Limited (HGC) for HK$14.5bn (US$1.86bn), with 18 banks providing financing to the private equity fund to back its acquisition. Huawei launched a US$1.2bn syndicated loan with nine banks this month while earlier in the year it issued US$1.5bn of bonds. Ecommerce giant JD.com is also about to close a syndicated loan between US$750m to US$1bn, arranged by four banks, according to TMT Finance. Datacentre operator 21Vianet also issued international bonds for US$200m in August, while Capital Square Partners is raising US$150m through a syndicated loan to back its acquisition of global outsourcing company Aegis. 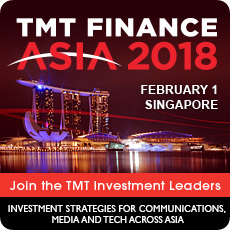 The world’s leading TMT investment bankers, as well as CEOs and CFOs from Asia’s leading telecom, media and tech companies are meeting to assess next year’s investment and financing opportunities at TMT Finance Asia 2018 in Singapore on February 1. The annual executive only event, which takes place at Marina Bay Sands features over 75 speakers. Participating companies announced include Axiata, Indosat Ooredoo, Telkom Indonesia, AsiaSat, Emtek, edotco Group, Bharti Infratel, Protelindo, I Squared Capital, Alibaba Cloud, Irrawaddy Tower, Go-Jek, WeWork, Metronode, One Championship, Eleven Sports, Tata Communications, Sigfox, Apollo Towers, Goldman Sachs, DBS, ANZ, BNP Paribas, IFC, Huawei and Linklaters.